I think I’ve already blogged about how much I love charity shops. They are such a great resource for finding beautiful fabrics and other things that can be used in many creative ways. Recently I had to buy some new storage for our sitting room (my little boy is now getting into everything so I needed to stash my crafty bits out of the way). I bought a great storage unit from a certain Swedish shop. It is the perfect size for our sitting room but it unfortunately it looks rather drab and boring. I have to confess that I am a bit of a magpie when it comes to bits of fabric. Most of it I use in projects (scraps of a particularly lovely fabric are often saved for quilts or bunting) but sometimes I find stuff that I have to have but don’t know what to do with it. Most of these bits are head scarves. I love head scarves. I can’t wear them as they really don’t suit me but they often have such lovely patterns! Also as a lot of people don’t wear head scarves now, it is possible to get some beautiful prints for next to nothing, if you look in the right place. Car boots and charity shops are the best place for this! One man’s junk is another’s hidden gem! Anyway getting back to my storage unit…..I have this scarf which I must have had for almost 10 years, sitting just waiting for the right thing to use it for. It looks fantastic on top on my unit. I taped it down with some double sided tape as it does have a tendency to move around a bit. I also found a hand made vase in my local Charity shop which when amongst the other vases and china, looked really dull and old fashioned. To put it a nice way, it had been priced to get it shifted and the lady, when I asked to by it looked surprised and a little confused! One my scarf though it looks great! I finished off with a lamp that had been in our sitting room ever since we my husband bought it when he bought his first house (long before he knew me) and my Grandma’s wooden sewing box. It looks quite good, even if I do say so myself. The reason I mention the lamp is because this lamp has been in the same place for a long time but after I had rearranged things a couple of people (who shall remain nameless – you know who you are!) asked if the lamp was new because it looked really nice! It’s amazing what a difference small things can make and what you can find in charity shops if you look hard enough. I haven’t been able to take any photos my new crafty area (they all turn out looking rubbish due to the angle of the room/light etc). Instead I’ve upload a few of my other charity shop finds. 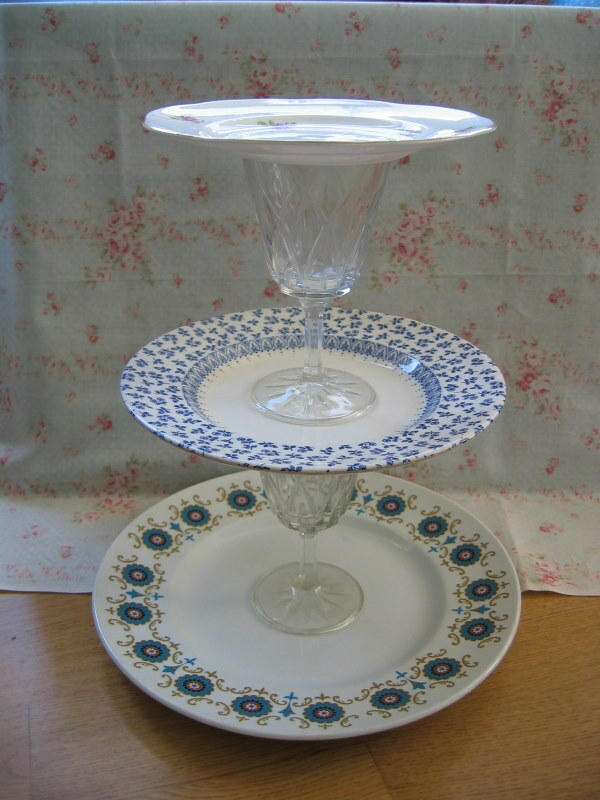 These are cake stands that I’ve made from some odd plates and small glasses (all second hand, all cheap, especially incomplete sets). the are so simple to make but so effective. You could use a set to do matching plates but personally I like the different plates, I think they work well together. A few handy hints of you are thinking of doing something similar. Choose glasses that have a wide, flat rim and a flat bit on their base (this helps them to stick to the places). Super glue seems to be the best adhesive. They are quite fragile but, I think, stunning and a fantastic way to display cakes or biscuits! Here is one final find, and I think one of my favourites. One thing I love about winter is the long, dark, cold evenings. I love the cosy feeling you get when your snuggled up with a blanket. We don’t have a fire but I do like putting candles in the fireplace, having the lights down low, lighting my candles and relaxing with a glass of wine. These little cups I found in my local charity shop. They are probably the size of espresso cups but china tea cups. 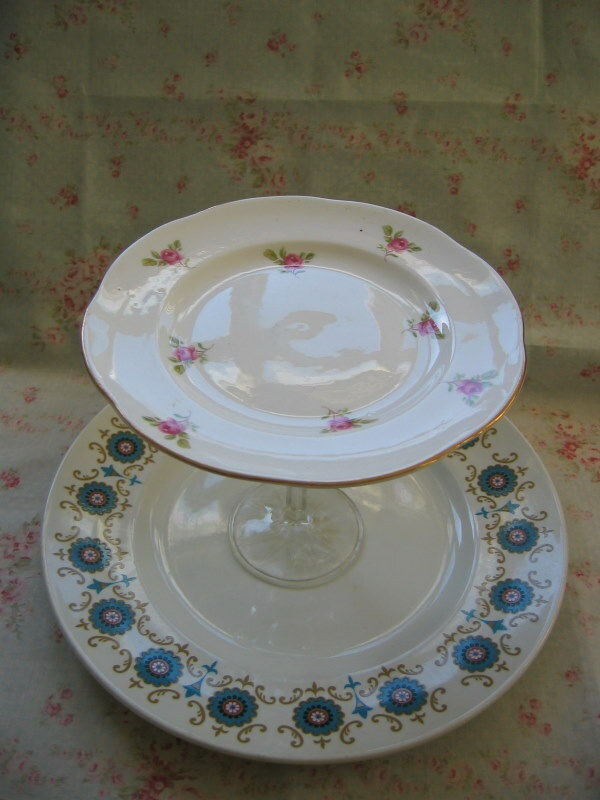 I liked the floral pattern on them and the saucer that they came with. I popped a tea light in them and they turned into candles! 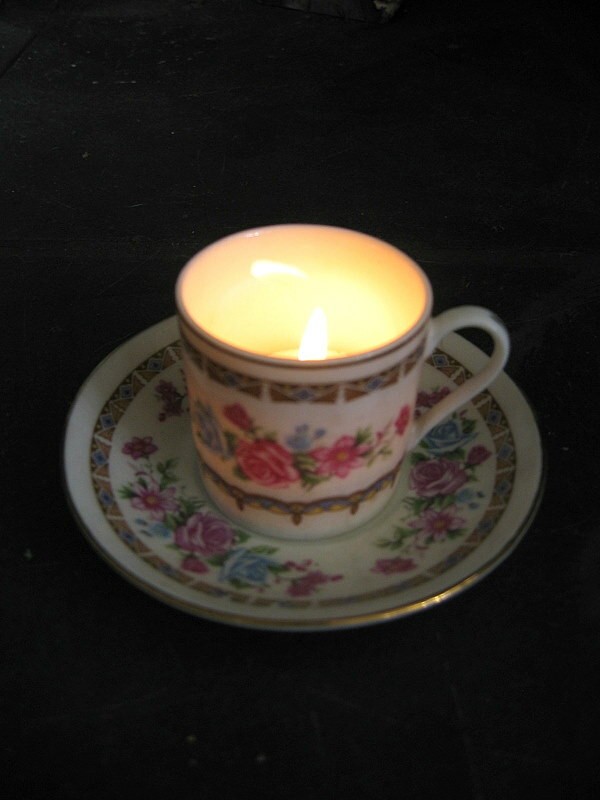 I know some people fill cups with wax but I actually think that due to their size, a tea light works better. When it’s lit it lights up the flowers beautifully.